Wimbledon is in full swing at the moment, and if you’re like me you might be wondering how to get a little of their energy. Well, I have one way I can think of and it involves some lovely green powder, a whisk and a pretty bowl. No, I’m not making a potion, just some Matcha Green Tea! The lovely people at mhoula.com sent me a bundle of Matcha and the traditional tools to make it in (keep reading for 20% off matcha tea)! So what is matcha green tea? Well, it’s actually nothing strange or chemical, it’s just 100% organic green tea leaves, ground up into a powder. The Japanese have been drinking it for years, and Buddhist monks use it to keep them alert and awake during meditation. So, why have we taken so long to catch on? Never mind that, it’s here now! Antioxidants in Matcha compared to other superfoods. And as well as filling yourself with lots of health boosting antioxidants, you’ll find that Matcha helps with weight loss (increasing fat oxidation), healthy skin and keep you calm as well as energised (contains two special amino acids to provide a sustained energy boost over 4-6 hours, rather than an instant caffeine hit. Alert and relaxed at the same time – wow, I need this! You can find loads and loads more info about Matcha on the Teapigs website, so you don’t just have to take my word for it. So now, I’m going to get on with the all important bit, and tell you about my experience with making it and drinking it. My first ‘experiment’ happened the second I arrived home from work on the day my lovely little package arrived in the post. I didn’t fancy a shot of juice, I fancied something relaxing and calming and a little bit creamy and indulgent, so I looked up the Matcha Latte recipe. Very simple – only I mixed mine up in the gorgeous bowl from the kit (it seemed a shame to be sent something and not use it). 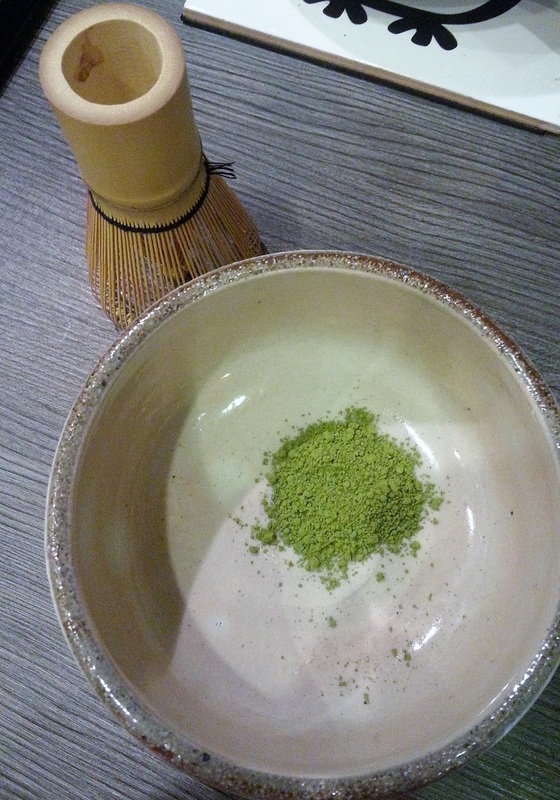 In the traditional tea ceremony, it is prepared in and drunk from a special matcha bowl. I skipped the ceremony, but you can read all about it here. Nice and easy to whisk into a paste, then I simply added hot Koko Dairy Free Milk (you can add any milk of your choosing, but I think non dairy is probably best). I didn’t top with frothy milk, as I was feeling a bit lazy and don’t have one of those little electric whisks. But you can see my lovely green creation above. Pretty and green, and tasted lovely. A little bitter to have on its own for my taste, so I added a splash of agave. Perfect – and really quite quick and easy. Now for the confession – I had it a little late in the evening, and it kept my energy boosted until after bedtime. I got plenty of reading done, but I would advise you to take this in the morning or afternoon (unless you’re a night owl)! So, my next attempt was first thing in the morning, and it was a healthy green shot of goodness! I simply popped the 1/2 teaspoon of matcha into a wide glass, added some apple juice and whisked it all together with my bamboo whisk. As everything was cold, it didn’t blend quite as easily as with the hot milk, but I got there in the end and it tasted great. Apple with a twist! You can make them in the little shot glasses from Teapigs (they gave me one in my kit) but to do this you need one of those little slim electric whisks. So far, I’ve tried it for around 8 days, and it’s great stuff. Really gives you a little boost of energy. Towards the latter stages of the week, I started to see my skin clearing up to, and I’m guessing it could well be that. I’m going to keep going and I’ll tweet you with my progress! I also want to have a go at making some smoothies and cakey treats with it in, but so far I haven’t had time! If you’d like to try Matcha from Teapigs, just go to the Teapigs site and you can get a special 20% off using code: MMMHOULA14. You can thank the lovely people at Mhoula for this discount – visit their site and get even more great offers and voucher codes! If you do give it a try, I’d love to know what you think. Please leave your comments below! Previous Post Who Made Your Clothes? Next Post Wonderland of Random Goodness!